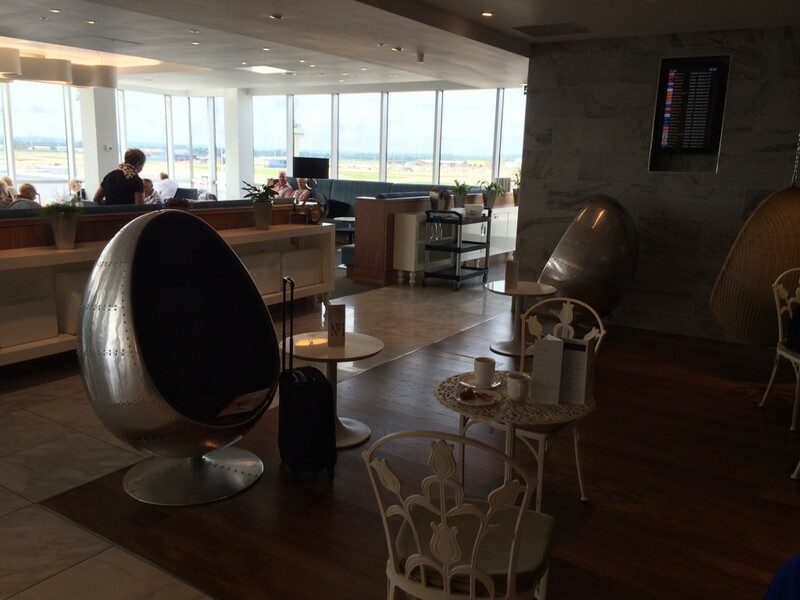 This is my review of the No 1 Lounge at Gatwick airport, in the North Terminal. I was in Gatwick on Monday, taking a British Airways flight to Amsterdam. The BA lounge facilities at Gatwick are a bit of a sorry state. It used to be literally twice the size as BA originally had the ground floor as well as the first floor. 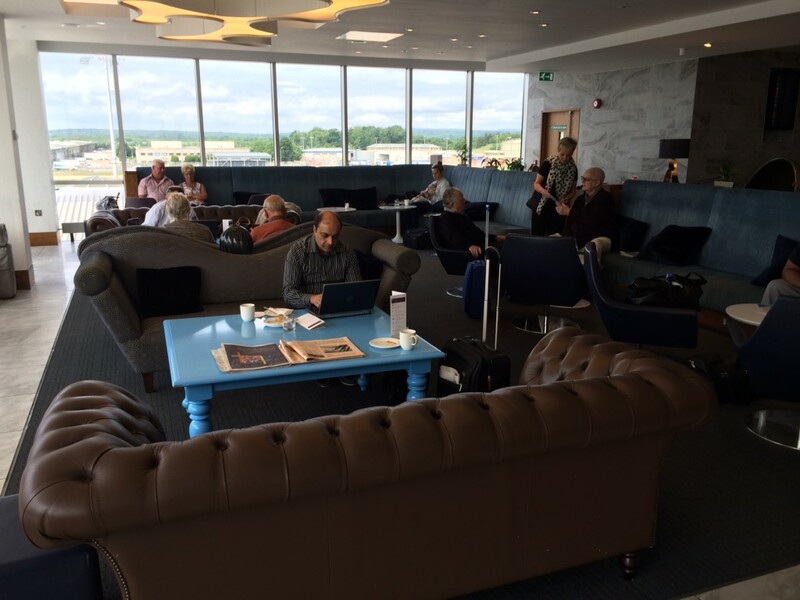 The current small lounge – almost embarrassingly small on the First Class side – hasn’t even had a ‘Galleries’ facelift and still trades as ‘Terraces’. This is the entirety of the First Class lounge. I was standing against the back wall and you can see the other wall at the far end. It doesn’t get any wider at the top either! I decided to give the No 1 Lounge downstairs a try. I got access via the Priority Pass that comes with my American Express Platinum card (see my review). You can also get in via the free Lounge Club passes that come with the American Express Gold card. Or, of course, you could pay – but not on the door as its £30 …. These pictures are not great. They make the lounge appear dark, when actually it is incredibly light because of the huge windows – which is why my phone decided to compensate and make the pictures dark ….! There is a full length bar. Not all drinks are free although, given it was early morning, I didn’t investigate too much. Like the BA lounges at Gatwick, there is some cold food on a buffet with hot food available to order. Your first hot dish is free with a £4 charge after that. I wasn’t there long enough to order any food unfortunately. My pictures do not really do it justice. 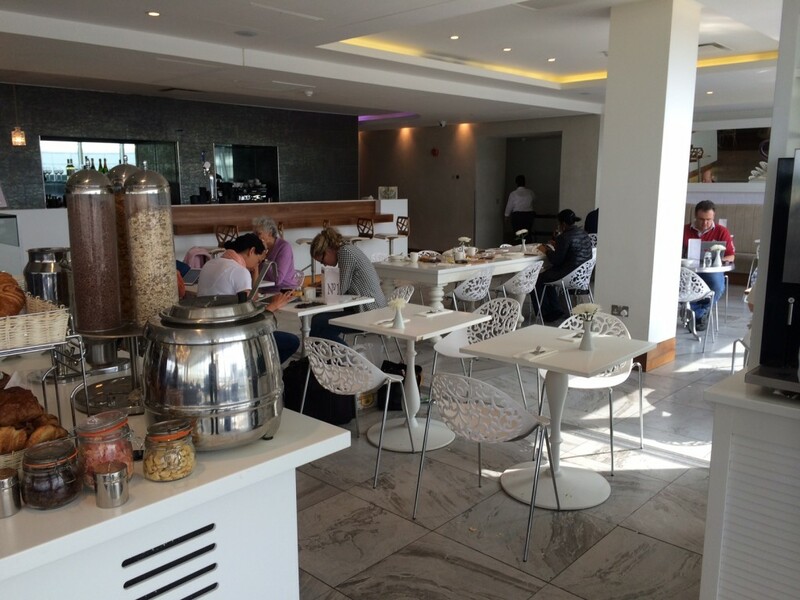 I do recommend that you give it a try next time you are in Gatwick North even if you have BA lounge access as well! I am especially keen to try it out with my kids as the main BA Terraces lounge did not have much to keep them occupied last time we were there. Foodwise, the No1 Lounge at Gatwick is better than the BA lounge by far. I actually prefer the No1 Lounge in the south terminal – the food seemed a bit more extensive and they give you small bottles of water there rather than just glasses. They also serve delicious chocolate brownies in both. 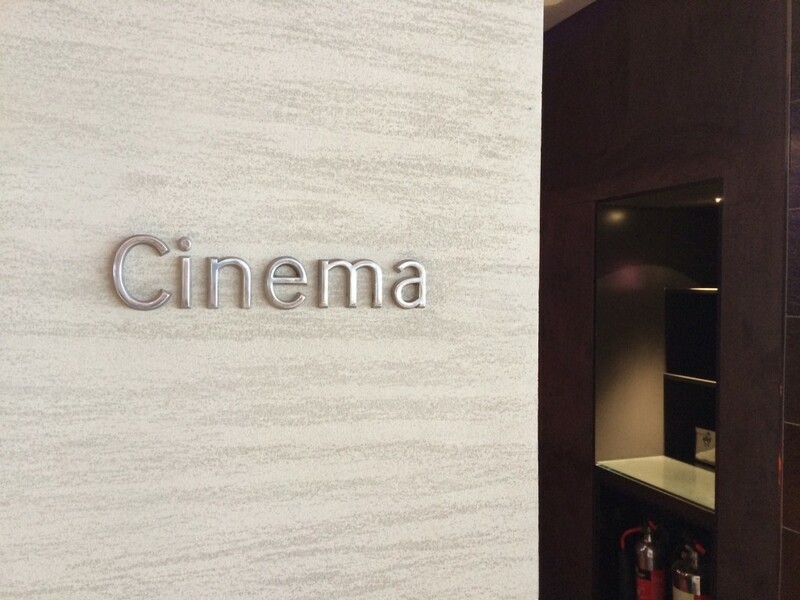 In the north terminal you can at least easily visit both lounges if you have the privileges – stop off for a spot of food at the No 1 then head up to the BA lounge for a better glass of wine. I have always liked the Terrace lounge at Gatwick North. On the occasion I passed through without access to it, I used the No.1 which is fine but the wifi is terrible. Also the snack options are inferior in my humble opinion. Amusingly, I got ‘trapped’ in the BA stairwell a couple of weeks ago. The stairs heading to BA’s former downstairs level are still open, and the signs about a downstairs level are still there, so I headed on down in search of bliss – only to find the door locked behind me, and the No 1 Traveller lounge also firmly locked! 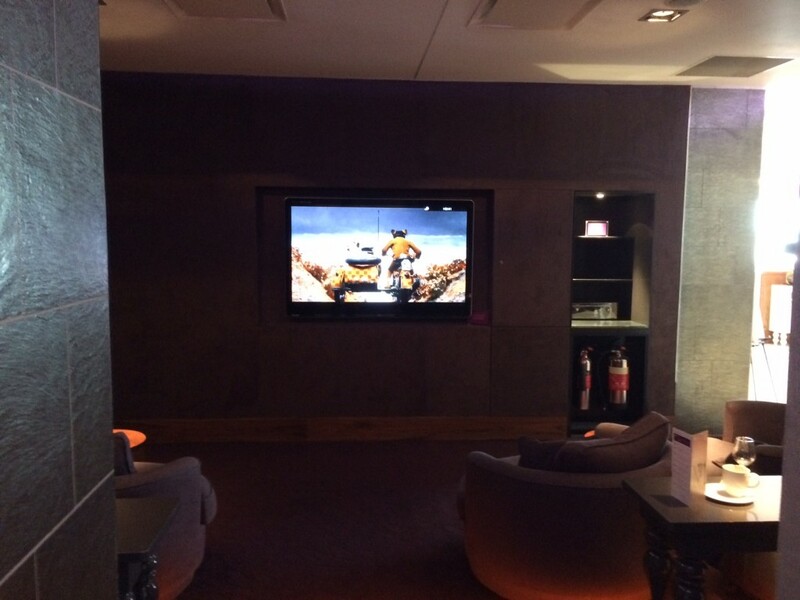 I ended up having to catch someone’s eye in the BA lounge to get back in! I do prefer the no. 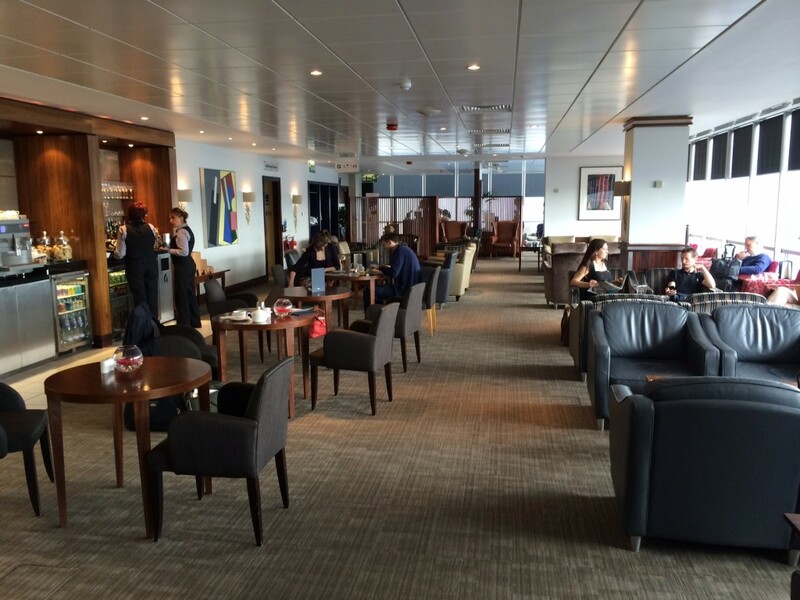 1 lounge at gatwick to the servisair offer. It can get very busy with people with children at peak times though. I was a bit narked on my last visit when I had to wait nearly an hour while two kids were playing around with the Macs… I was desperate to confirm a hotel booking prior to departure and my phone had died! The drinks are free apart from the champagne, they have a dedicated barman so it’s not help yourself!! Tricky one. I tend to find the BA lounges fine during the times I typically visit. Yes, on Saturdays they get busy before the Caribbean depatures and there are some peaks during the week too. The big downer is the removal of any half-decent food at around 14:45 (or was it 14:15?). When I had access, the LGW F lounge was never overbusy, so I’ve always liked it and found service prompt and good. Did investigate No1. Its good too. Lucky to have 3 pretty decent lounges at LGW N. So I’d definitely try No1 again during the BA ‘no-food’ windows, or if its looking quiet when the BA club lounge is busy. Actually, for food options, I had the opposite experience. We were there for breakfast, and we were only allowed one free order of hot food, so we went for pancakes, which were clearly just microwaved from a packet. As hard as concrete. Tables were not cleaned, we had to clear the dishes ourselves. I had some cheese and biscuits, then left to go to the BA lounge. Much better food. Fruit salad was fresh, nice hot croissants and pain au chocolat. OK, the lounge furniture needs a bit of updating but at least it wasn’t grubby like the No.1 lounge. Yes, during the busy school holidays, the No. 1 lounge at LGW North gets packed. They do have ice though. There is a machine at the end of the drinks counter! There is a very good No. 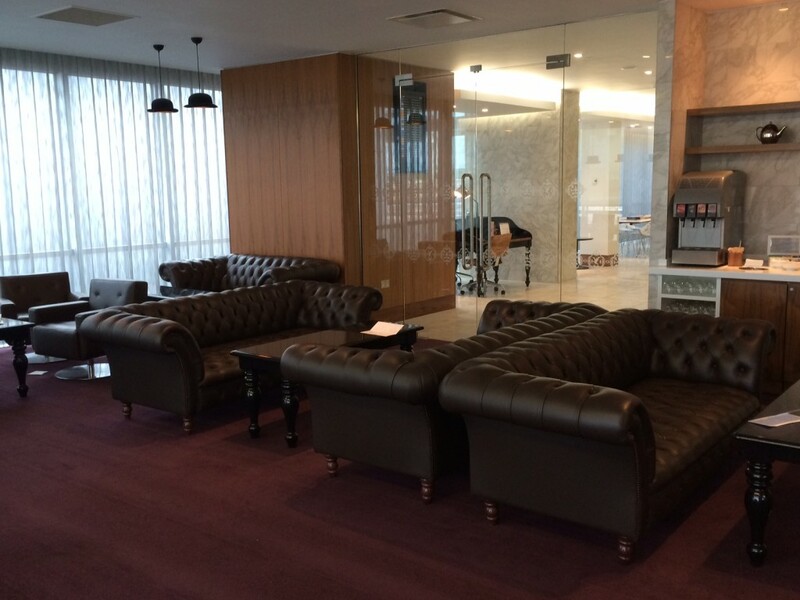 1 lounge at BXH, we used it with our comp lounge club admissions via the Amex Gold charge card. Also, if you had and cancelled an Amex Gold keep the lounge club card, it is preloaded with 2 visits and doesn’t expire. I was in the LGW Terraces Lounge this morning. Admittedly early at 6.00am on a Sunday, but the lounge was very quiet, the food more than adequate and a good experienced overall. I suspect it is far less enjoyable at busy times and when we were leaving, it was starting to get busier. Looks like No 1 Traveller is expanding (downwards?) which will hopefully help alleviate pressure on the original LGWN lounge.